Fulcrum Concepts offers multiple configurations of toolboxes that have been custom tailored to serve a specific purpose. For example, the Weapons Maintenance kit was designed to provide every tool necessary to perform maintenance on the GAU-19 and/or M-134, depending on the box and your requirements, to include various mounting systems and platforms. Keeping efficiency and safe maintenance practices in consideration, this Snap-On tool box and tools feature laser cut foam for tool accountability and each tool is laser etched to match the tool box. With a telescopic handle, durable wheels, hard exterior, water proof shell, this tool box is equipped for shop or maintenance performed in even the most austere environments. This, as well as other tool boxes can be customized to meet specific customer requirements. The Avionics Tool Box has mobility in mind, but can be right at home in your avionics shop. You can’t plan for everything in a mobile tool box; however, after 6 years of design evolution, we have the answer. 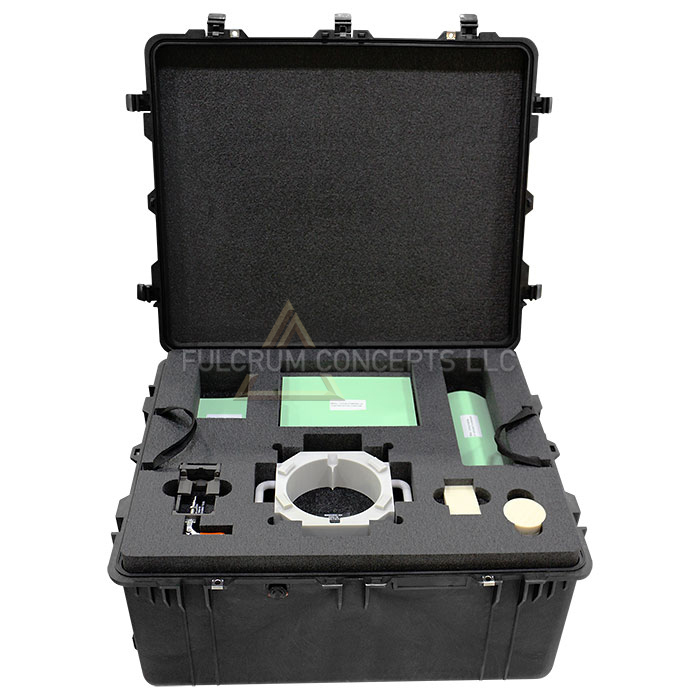 The Fulcrum Concepts Avionics Tool Box reflects over 34 years of avionics and electrical experience in military and civil aviation. It is comprised of the best Snap-on and avionics specific tools available and shadowed in five pallets for accountability contained in a Pelican 1650 case. Built from years of hands-on experience maintaining the GAU-19. 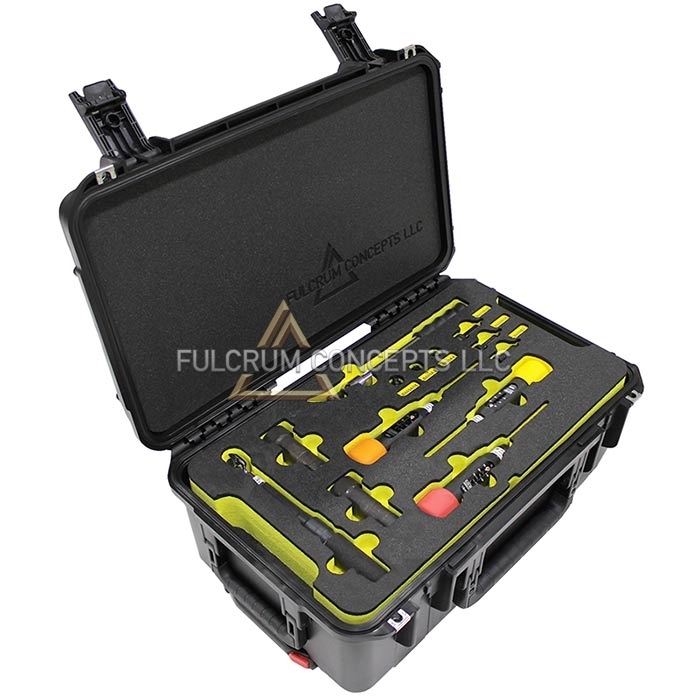 Contains 5 tools custom built to maximize efficiency when performing maintenance and repairs. The GAU-19/M134 Tool Kit was designed to provide every tool necessary to perform maintenance on the GAU-19 and/or the M-134 weapon system, depending on the box and your requirements, to include various mounting systems and platforms. Keeping efficiency and safe maintenance practices in consideration, this Snap-On tool box and tools feature laser cut foam for tool accountability and each tool is laser etched to match the tool box. 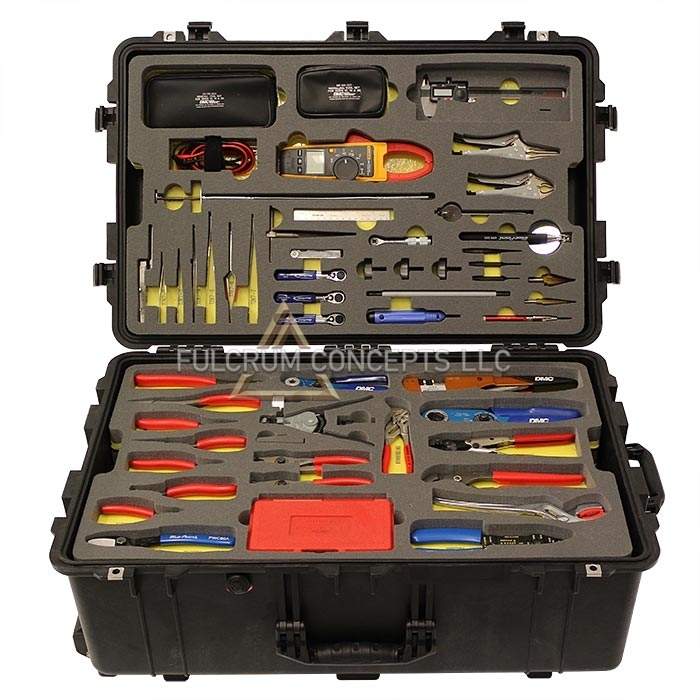 With a telescopic handle, durable wheels, hard exterior, water proof shell, this tool box is equipped for shop or maintenance performed in even the most austere environments. 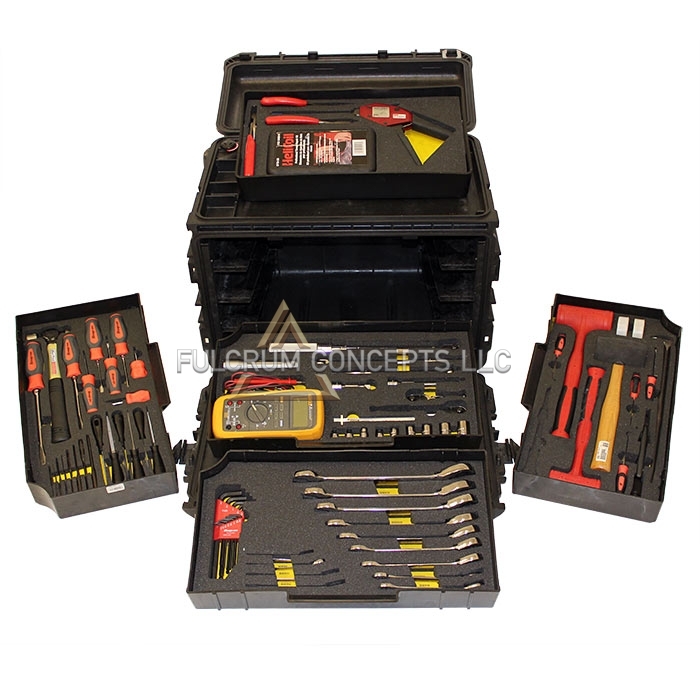 This maintenance kit can be customized to meet customer requirements. Meets the specific needs to perform organizational through intermediate and scheduled maintenance of the GAU-19 and M-134 Gatling gun systems. Tool and consumables kit are both stackable Snap-On Mobile Tool Chests. Case is chemical resistant, dust-proof, and watertight. Has fold-down handle, wheels, and automatic pressurization equalization valve. 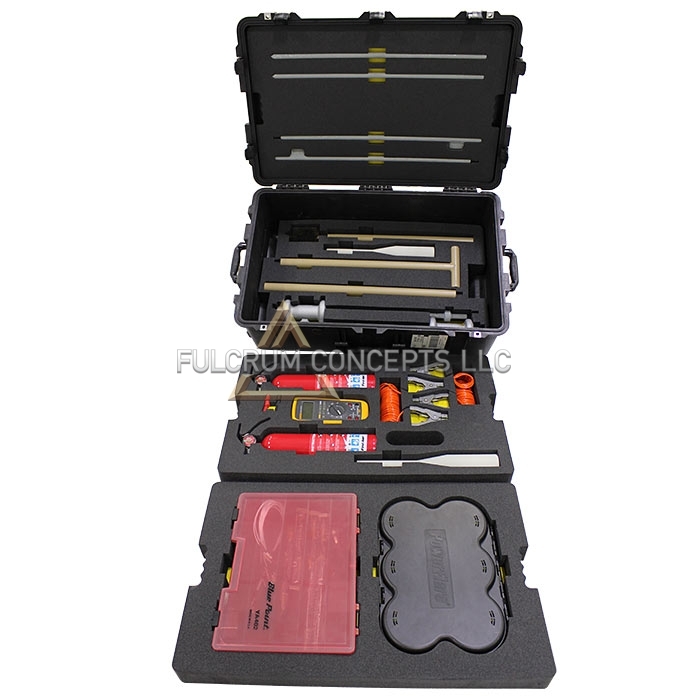 Tool kit uses quality Snap-On tools enclosed in precision cut foam optimally grouped for easy of toolbox inventory, productivity, prevention or minimization of Foreign Object Damage, and reduction of mistakes. Includes the necessary tooling to perform bore sighting procedures for all helicopter mounted 2.75″ rockets and 7.62mm or .50 Caliber gun combinations on standard NATO bomb racks. TFCLLC is proud to announce the availability of a completely modular and self-contained FARP equipment box. The standard box contains all required equipment to safely establish and operate a two point FARP site. Contained in the transportable Pelican case are (2) collapsible grounding rods, (2) 20 ft. grounding cable with clamps, (2) fire extinguishers, (2) 2.75” rocket loading devices, a 2.75” rocket pod collapsible bore brush, a Fluke Multi-meter, a six piece Landing Zone light kit (IR available), (2) rockets test cables (spider set) and a small parts box to hold miscellaneous items. The set can be custom tailored to individual customer’s needs with the addition of PPE, wing cords, PLL, etc. 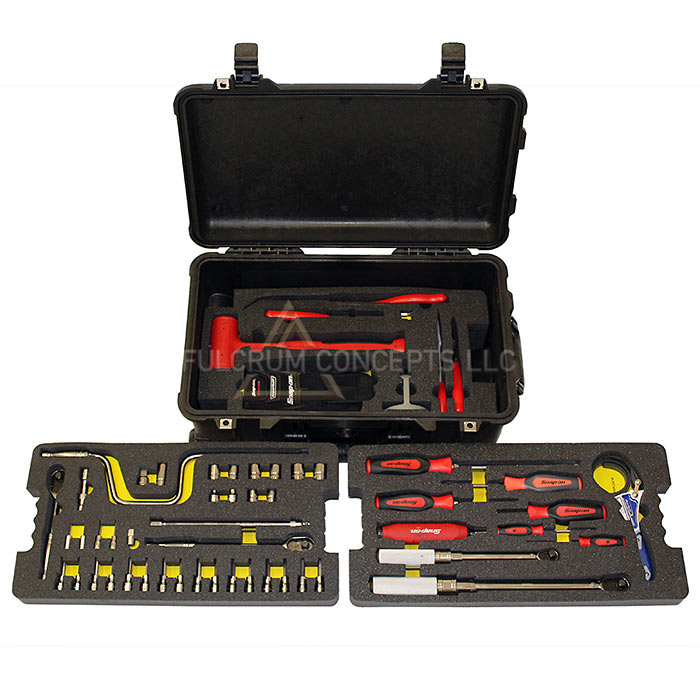 This tool kit can be customized to meet customer requirements. Self-contained tool set with all the tools required to convert Mk 81’s to a GBU-58’s. The Fulcrum-Concepts-produced Click Bond Tool Kit has been assembled for the repair and maintenance of Click Bond fixtures on HondaJets. This tool kit has been assembled specifically with HondaJet dealer sales and service centers in mind and is currently in use with a HondaJet dealership. The Click Bond preparation materials, adhesive application tooling, calibrated tools, and fixture adapters are based on the HondaJet required tools list for those seeking approval to become a HondaJet dealer. Click Bond products, tools, and adapters are housed in two custom yellow foam cavities that have all items individually identified with contrasting black letters and numbers at the bottom of each cavity or below. The two pallets are housed in an SKB 3i-2011-7 injection molded, MIL-STD, waterproof case that is molded of ultra-high strength polypropylene copolymer resin. 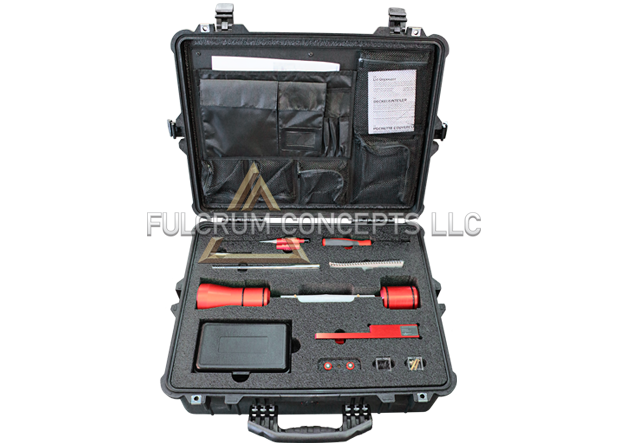 The Click Bond Tool Kit designed by Fulcrum Concepts offers the end user tool accountability, comfort in knowing their rugged tool kit can travel or ship in safely, and comfort in knowing their investment will be environmentally safe whether in the field or in the hangar.